Jet Set Smart: L.A.'S ANDAZ WEST HOLLYWOOD IS ALL ABOUT "ANDAZ"
Choosing L.A. as a jet-set destination was easy - finding the perfect hotel was not. Of course, the perfect hotel should be a place you look forward to going back to at the end of a long day of shopping, dining, sight-seeing (or whatever else you spent the day doing) – offering a big, comfortable bed lined with crisp, clean sheets of a ridiculously high thread count and lots of plush pillows. But the perfect hotel should also be a place you would be totally content never leaving. Enter Andaz West Hollywood - conveniently located on the hip Sunset Strip in the heart of West Hollywood for the jet-set crowd. 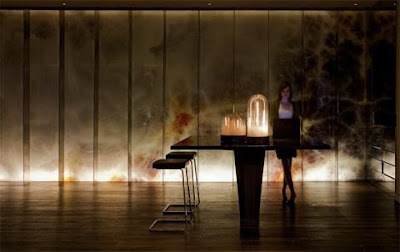 Andaz, an uber-trendy, yet chill hotel invites you to experience it rather than just visit. In keeping with that philosophy, when you stay at Andaz West Hollywood, you are encouraged to explore and share the local culture while enjoying the Andaz service which caters to your individual needs. In fact, the word "Andaz" means "personal style" in Hindi, and that's exactly what you get - from the minute you arrive right up until the second you (sadly) leave. 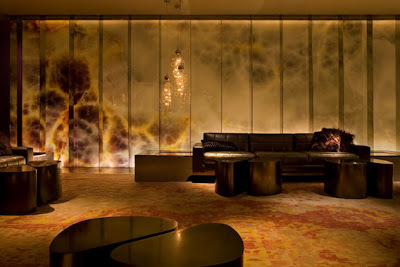 Naturally, there was a lot of hype last year about the opening of Andaz West Hollywood. The hotel - the first high-rise hotel on the Sunset Strip – originally opened in the 1960's as Gene Autrey’s Hotel Continental and was taken over by Hyatt in the 70's. It quickly became a hot-spot for rock stars (including certain members of Led Zeppelin, The Who and the Rolling Stones) and was often referred to as “The Riot House” or “Riot Hyatt” on account of the wild events that often transpired there. 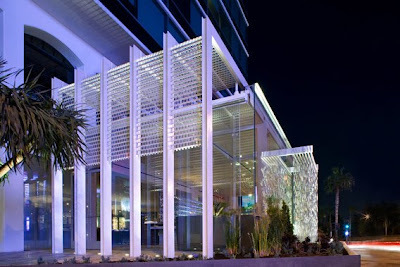 After undergoing a complete renovation, the hotel re-opened as Andaz West Hollywood in January 2009. The first thing you’ll notice when you check-in to Andaz West Hollywood is that you don’t actually “check-in”. Instead, you are warmly greeted by your Andaz Host (who is also your bell attendant and concierge) who offers you a complimentary glass of wine while you take your seat on an over-sized leather couch in the “lobby” (which more closely resembles the stylish apartment one of your hip jet-set friends might own). Just a few minutes later, you are checked-in right from the couch on your Host’s laptop! Once you have finished your glass of wine, your Host (with your luggage in tow) will show you to your room, pointing out all the details of your contemporary new digs and providing recommendations for the best insider places to eat, drink, shop and otherwise indulge yourself. Your Host will let you know that all snacks and non-alcoholic beverages in the room are complimentary – a pretty amazing deal. You’ll also may be happy to hear that your room is equipped with free wi-fi. 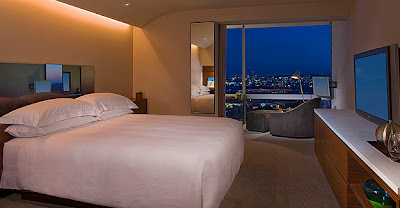 Besides all of these great perks, the second you enter your room you will immediately notice the clean, modern design element, and the spectacular views of either the Hollywood Hills on one side (standard rooms) or the Sunset Strip and downtown L.A. on the other side (available for a $50 upgrade). 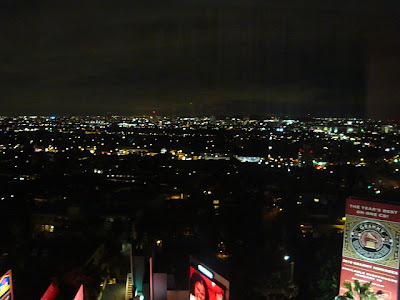 We were lucky enough to get a room on a high floor facing the Sunset Strip and downtown L.A. If you can, request the same when you visit and you will not be disappointed. While the view at night is pretty incredible, the day-time view is amazing too – it almost feels as though you are floating in the clouds as the world passes you by down below. 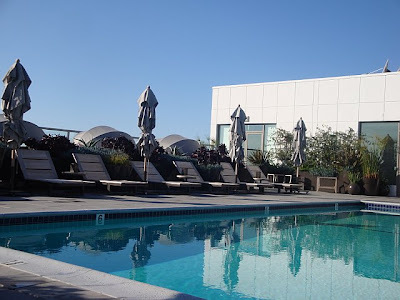 And speaking of floating, you must (at least for a short while) leave your room and head to Andaz West Holyywood's swimming pool- the highest roof-top pool in L.A. There are lounge chairs where you can soak up that good California sunshine, or covered cabanas so you can escape it and enjoy lunch. 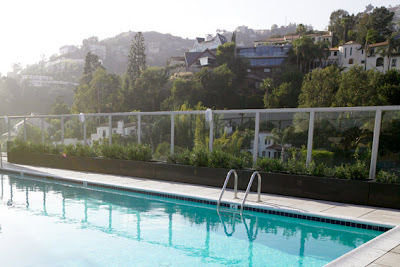 The best part of the pool area is the views of the Hollywood Hills. This is why you jet set to L.A. folks! 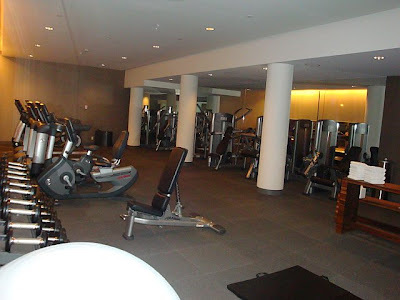 Of course, if you feel the need to burn off calories and work towards having a celebrity body while in the land of celebs, Andaz West Hollywood has a great gym with all of the amenities you need from elliptical machines and treadmills to free weights. And hitting the gym is probably a good idea because you will definitely want to check out RH – the hotel’s amazing restaurant featuring the cuisine of Southwest France with a California twist. Executive Chef Sebastien Archambault (who worked under Alain Ducasse and received a Michelin Award for a restaurant he ran in Spain) creates masterpieces in the kitchen along with his culinary team. RH should not be missed, and I’ll have lots more to say about RH tomorrow, so stay tuned! 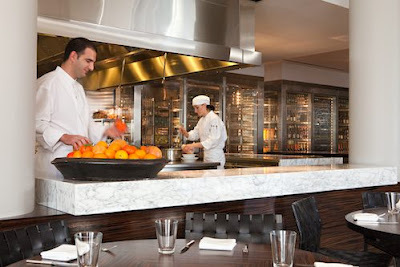 Bottom Line: Andaz West Hollywood is one of my favorite hotels in L.A. for its style, location, and incredible restaurant. But, what really makes Andaz West Hollywood shine is the hotel staff who finds your "Andaz" (personal style), anticipates your every need and delivers anything and everything your little heart desires! Rates start at $225 a night. Andaz properties can also be found in London, New York City and San Diego. Wow! Sounds like a great hotel. Where is the one in New York City? Bryant Park area of Midtown Manhattan, across from the New York Public Library)...it's set to open in April of this year! Thanks for reading Jet Set Smart! This is an awesome hotel. If I ever get to LA it would drfinitely be someplace I would want to stay. From checking in to the room and the views along with the review of the chef at the hotel restaurant who could ask for anything more?